John Coltrane died 50 years ago today. Tommy Smith turned 50 in April. Clearly the planets were correctly aligned for the Scottish saxophonist to make what he describes as a “most terrifying journey” - a dedicated album to Trane. 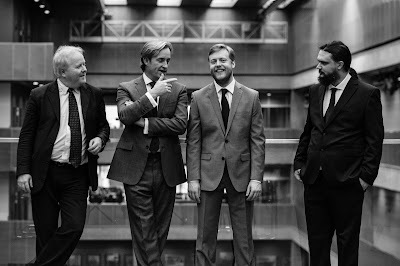 Tommy Smith explains all to LondonJazz News. Tommy Smith has an acute sense of the jazz tradition. Not only does he pay tribute to its various masters in his own work - think of his sumptuous 1997 album, The Sound Of Love, on which he interpreted the ballads of Duke Ellington and Billy Strayhorn - but with the big band he founded, the Scottish National Jazz Orchestra, he has honoured Count Basie and Benny Goodman, Miles Davis and Gil Evans, plus Mingus, Kenton, Oliver Nelson and so many more. But he also understands that it’s important to honour that tradition in its underlying spirit, too, which means to do something new, to forge some fresh steps down the jazz path. Despite having led the SCJO on specially commissioned arrangements of Coltrane, he has waited till this golden anniversary year to devote one of his own band’s albums to the man. It was clearly a decision not to be taken lightly. Of course, he adds, Coltrane pushed himself hardest of all. Was there a lot of preparation? Again, Smith underplays it as “simple really”. Those musicians are pianist Peter Johnstone, a former Young Scottish Jazz Musician of the Year; the much-in-demand double bassist Calum Gourlay; and the Dutch drummer Sebastiaan de Krom who first became known to UK audiences as part of Jamie Cullum’s band and, like Smith, studied at Berklee College of Music in Boston. The band was assembled, but what would they play? “Well, there are so many wonderful tunes to choose from... so I thought I would record the music I play regularly, the more challenging songs that require focused imagination and interplay from the quartet. But I would so love to do another recording now with additional songs, as Trane wrote so many great vehicles for improvisation." Two of them, Transition and The Father, The Son And The Holy Ghost are more free pieces from later in Coltrane’s career. Smith claims he learned how to tackle these from a few masters. “I had a fantastic guru, Arild Andersen. Playing in his trio since 2008 has taught me how to tackle these free pieces with an open mind and open ears. Sebastiaan de Krom and I toured in 2001 with David Liebman and we learned a thing or two about focused energy and forward motion. Gary Burton, my other guru, taught me how to develop ideas thematically when I was 18, which is still an important part of my conceptual playing. In addition to the Coltrane compositions, there are some originals. Were they written specially for the album? Smith’s other tunes as he explains them are Embodying The Light and Embodying The Darkness, the first a simple blues with rhythmic Traneisms, the latter song based on Trane’s One Down, One Up. As Tommy Smith tells it, his first encounter with a Coltrane album was not an altogether happy one. “Remember, I had no money when I was a kid, and the money I did earn was only £5 per week playing with my group in a bar in Edinburgh, which was spent on saxophone reeds and bus fares, so, it always took me a few weeks to save up for a precious LP. “Ominously, the first Trane record I bought was Ascension, from a small record shop in Cockburn Street in the centre of my hometown. I took the album home and placed it on my parent’s record player. The cover had a photo of Trane sitting on a chair with a soprano saxophone in his hand, while he looked into the void against a pure white background, like he was adoring some heavenly peace. “I watched the record spin and listened to the chaos begin, skipped to the middle and end of side A, turned it over and did the same again. I unequivocally hated it! “So, I walked down to the bus stop and waited for the number 30 bus to take me from Westerhailes all the way back into town. Upon arrival, I demanded a refunded from the shop owner. Sadly, he didn’t give me one, so I left the album in the wee shop, said something stupid and stormed out in disgust. “It would take a good few years for me to understand and appreciate the brilliance of Ascension." And how about now. Does he have a favourite Coltrane album today? LINK: Buy the Tommy Smith Quartet’s Embodying The Light: A Dedication to John Coltrane. Last night's concert at the Edinburgh Jazz Festival by Tommy Smith and the quartet, playing music solely from this new CD, was superlative! A very impressive band! And on the hottest day of the year, in a sold out theatre that was hotter than a sauna, the band kept their jackets and ties on throughout!